Product #3748 | SKU AJA00065 | 0.0 (no ratings yet) Thanks for your rating! HD/SD/AES Sync Generator10 Blackburst and Tri-level Sync Generator with 7 outputs. 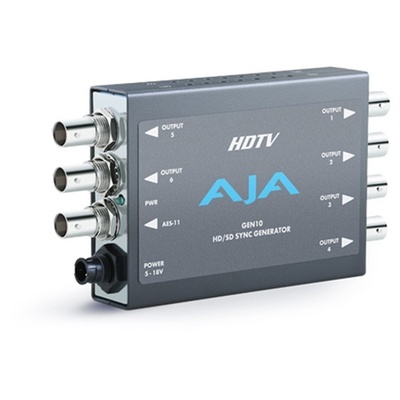 The GEN10 is a cost effective and flexible SD/HD/AES sync generator. The GEN10 features 7 outputs including 2 groups of independently controlled SD/HD sync outputs and 1 AES-11 output. The SD outputs can be switched between Color Black or Color Bars. HD tri-level sync can be switched between 19 different HD formats including all that are in use today. The AES-11 output can be switched between SILENCE and TONE. All outputs are in sync with each-other and are sourced from an accurate master time base.